I started developing mobile apps back in early 2009 after a friend suggested I try it out. Well I jumped in head first with no idea what I was doing, and it wasn't until August later that year that I finally had my first app approved and out onto the Apple App Store, getting my first real taste of app development success. Ever since then, I've made app development my career, have seen a lot of success, and have loved every minute of it. A lot has changed since those early days. Smartphones are everywhere these days, and while that's great news for app developers, it seems like it's starting to become more and more difficult for indie developers to be able to get a foothold in the app world and actually make money. For this reason, I decided to write this article in an effort to help my fellow developers and entrepreneurs have a better understanding of what they need to do to make their apps successful and profitable. Alright, so you have a killer idea for a killer app that will make millions of dollars! Something that nobody has ever seen before, and something that is sure to set you up with a nice retirement spot on a beach somewhere warm and sunny. Or maybe not? Maybe your app is something a little more simple. Something that would be great for you and your friends, but has the potential to make money with others as well. Whatever the case may be, when it comes to making money on apps, there are two very important things that you need to consider before starting development. What platform(s) will you support? What monetization strategy will you use? As dramatic as this may sound (and setting aside dumb luck), your answers to these questions could very well make or break the success of your app, and your company. The only options that you should really even consider for this question is either Android (Google) or iOS (Apple), since they are the ones that dominate the smartphone market. Their creators also happen to provide the most robust third party developer tools, which means that you'll be able to do a lot more with your apps with a lot less work. Some of you might be thinking, "Wait, what about other platforms like Blackberry or Windows Phone? There are lots of people who still use those!" While this might technically be true, it still doesn't make them serious competitors with Apple and Google. Their market share is nothing compared to Android and iOS who control 78% of the market, and who will continue to expand their control as time presses forward. So unless you feel there is a very important reason that your app should support one of the lesser platforms, your choice of what to develop for should only be between Android and iOS. Here is where the great divide begins to manifest itself. Everybody seems to have their own idea about which platform is the "best". Truth be told, at least from a purely technical standpoint, both Android and iOS are solid platforms to develop apps on. However, when it comes to making money selling apps, they are miles apart. I can confidently say that based on my own personal experience, if you are developing an app for distribution to the general public with the intent of making money, and you aren't a major corporation like ESPN or EA Games, you should develop your app for iOS before you ever consider porting it to Android. There are several reasons that lead me to this conclusion, both programming and business related, but the bottom line is simply this. As an independent developer, you will make more money with an app developed for iOS than you will with an app developed for Android. Now, allow me to explain further. Android users do not buy apps. It's a harsh thing to say, but unfortunately it's the truth. I believe that the root of the problem stems from the fact that apps are intangible goods, and as such their perceived value is entirely dependent on the conditions of the market that they're sold in. For example, Google loves to brag about how Android is an open source mobile OS, and how they have such open market standards for app development. In fact all you need to do to publish an app to the Android Marketplace (or Google Play as it's called now), is pay a $25 developer license fee, and then upload your app. That's it. While this approach might sound great in theory, it has led to a major influx of poorly designed apps that do little more than saturate the market, making it harder for quality apps to be noticed. Moreover because there is no mandatory review process for app submissions, and Java developers are a dime a dozen, lots of companies have chosen to develop quick one-off apps filled with ads that they release for free. The idea being that since there are so many Android users on so many different devices, that the sheer volume of usage will generate enough ad revenue to make their apps profitable. The problem with this is that because so many companies have taken this approach, the Android app market has become flooded with so many free apps that do the same thing, that it's created an end-user mentality of, "Why would I buy your app when there are six others that do the same thing for free?" Even if your paid app is far and away the greatest app ever for what it does, 99% of the time it's going to lose to its free competitors. Apple on the other hand, requires that every new app submission and update be subject to a mandatory review process in order to ensure that the app in question adheres to all human interface guidelines and development standards set out for their platform. This helps to stem the flow of one-off freebie apps, which in turn helps to level the playing field for people selling paid apps. I have an app called Find Me Food! that I've released for both iOS and Android. The Android version of Find Me Food! has had a grand total of 14 sales between the dates of February 8 2012 and March 14 2012 (a little over one month). 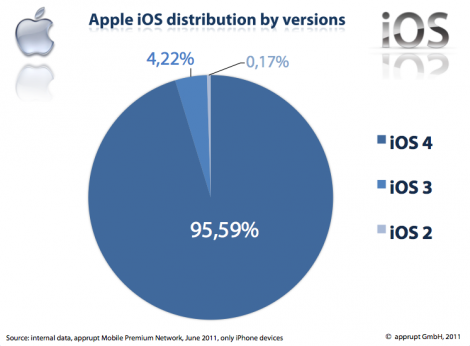 Whereas the iOS version has sold 61 units between the dates of March 5 2012 and March 11 2012 (one week). Or in other words, the iOS version of my app makes nearly five times as much money in a single week as the Android version makes in an entire month. When it comes to making money with apps, I've found that the first 90% of the work comes from developing the app, and the other 100% of it is in the marketing. A large part of your product's success will hinge on the the distribution platform you choose for it. For iOS you have the Apple App Store, and for Android you have the Android Marketplace (now called Google Play). I personally feel that the App Store is the better choice of the two, at least from a marketing standpoint, for two reasons. 1. With the App Store, you can generate promo codes for any of your apps that people can use once to download them for free. This is useful when submitting your app to review websites, as well as for special app giveaways and the like. Google Play however does not have this feature. If you want to give someone a free copy of your app, you actually have to provide them with a copy of your app binary. I don't know about you, but I'd much rather just give someone a one-time use promo code, instead of a full copy of my app that they could freely distribute to anybody they like without me ever knowing. 2. With Google Play, if you ever decide to make your app free, it's stuck like that __forever.__  Which means that you won't ever be able to quickly bolster your paid app's popularity and user base by making it free for a weekend. iOS offers uniform hardware standards. One of the major reasons that Android has been able to come to control nearly 50% of the smartphone market, is because it is an open mobile OS designed to be able to run on just about any hardware. Which makes it possible for handset manufacturers to be able to put out cheap smartphones. However, this open attribute of Android's is a double edged sword. Because Android isn't designed to run on specific hardware, it loses a lot of finer performance optimizations that iOS has. It also forces developers to choose between either designing their apps to support the majority of handsets by tailoring their performance to the slowest device, or designing their apps to only work with specific handsets. Depending on the kind of app you are developing this may or may not be that big of an issue for you. However as you start to develop more resource intensive applications such as games, or augmented reality apps, it starts to become a real concern. On the other hand, developers making apps for iOS (for the most part) don't have to worry about this issue since Apple designs their mobile OS specifically to their own hardware (iPhone, iPod Touch, and iPad). This guarantees your apps the least amount of operating overhead between the OS and hardware, and the knowledge that all of your users are using the same hardware with only minor deviations in performance capabilities. One example of how this advantage can have a major effect on your app, is if the app does a lot of mathematical calculations, such as real time video data processing for augmented reality. If you were developing your app for iOS, then you would know for certain that any supported Apple device that would be running your app (read: anything newer than an iPhone 3G), would have a Cortex A8 (or better) CPU. Which would mean, that you could implement a video processing algorithm that uses ARM NEON intrinsic functions to process eight pixels of a video frame at a time, instead of just one. However, developing this same app for Android would require that you implement an additional non-intrinsic (and much slower) video processing algorithm for those devices that don't have Cortex A8 CPUs. In addition, because you have no way of knowing what the processing power is of the devices your users will be running your app on, its performance could vary greatly from device to device. More iOS users are running the same, and often the latest, firmware. Every time Apple or Google releases an update to their mobile OS, there are lots of awesome new APIs and other things added which help developers make even better apps. The only drawback to this is that these updates are only useful if people are actually using them. That being said, most iOS users on average are running the latest and greatest version, or are only one or two minor releases behind. Unlike Android, who the majority of its users are still running very old revisions of the OS. As of writing this article, the latest and greatest version of Android is version 4, codenamed Ice Cream Sandwich. However, according to Google's own platform version usage statistics, only 1.6% of Android users are actually using this version. The majority of Android handsets (62%) are instead running the much older version 2.3. This is unfortunate, because developers who want their apps to appeal to the majority of Android users have to forgo the features and improvements introduced in Android version 3.0 and beyond, and instead tailor their apps to the much older 2.x versions. What's even worse, is that since it's up to manufacturers to handle porting Android to their devices, there's no guarantee that they'll ever see an update! Take for example my Samsung Galaxy S 4g, the most up to date firmware that Samsung offers for this phone is Android 2.3.6, and there appears to be no plans to make version 3.0 and beyond available. Unlike Apple, whose devices are all capable of running the latest version of iOS. It is a little bit more difficult to accurately gauge usage statistics for different versions of iOS, because Apple does not maintain active reports like Google does. However, fairly reliable usage statistics can be found from the blogs of various app developers. Despite the chart above being a year old, it more than illustrates my point that iOS users on average run the latest (or near latest) available firmware on their devices. There is nothing wrong with developing an app for Android. Despite the flaws and issues discussed above, it's still a solid mobile platform. That being said, I would highly recommend that you develop your app for iOS first, before you ever consider porting it to Android. You will make a lot more money doing so. There are a few different ways that you can make money selling apps. It's important that you choose one or more strategies that play to the individual strengths of your app, so that you can squeeze as much revenue out of it as possible. Below are some different monetization strategies you could employ, as well as my thoughts and experiences using them. The tried and true method of selling your apps for a fee. It's straightforward and simple, and if you've got a high quality app, it's the way to go (usually). With this strategy, you release your app for free, but fill it with ads. The idea is that because your app is free, it will get a lot of downloads (which is usually the case), and that all of those users seeing ads will generate a ton of ad revenue. While this may sound like a great approach in theory, in reality it's a fool's bet. Ad revenue is a joke. Unless you've created the next Angry Birds or the very first Flashlight App, your ad revenue isn't going to be nearly enough to constitute a reasonable return on your investment. To illustrate this point, let's take a look at some statistics from my app iManga Reader Lite, which uses the Freemium App Sales strategy (outlined below). As you can see from the chart above, for one day's worth of ad traffic, almost fourteen thousand requests for ads were generated from the app, of which only about 53% were actually filled. This produced a grand total of $1.49 in ad revenue for that day. Granted, some days are better than others, but this is about the general trend for ad revenue for this app. The bottom line is that making money off of ad revenue should be approached from the standpoint that it is a supplement to your overall profits, and NOT the main contributor. The margins are just too small for most people to be able turn a profit with them alone. A freemium app is a fully featured paid app that you release for free with certain features disabled, and ads placed throughout the user interface. The idea behind it being that lots of people will download it because it's free, and then they can opt to remove the ads and/or enable the advanced features of the app by making one or more in-app purchases. This is a strategy which really shines when you release a fully featured paid version of an app, and a freemium version of it as well. Some examples of this include my own apps iManga Reader Pro and iManga Reader Lite, as well as other apps like Words With Friends and Words With Friends Free, or Angry Birds and Angry Birds Free. A huge benefit to employing a paid and freemium app monetization strategy, is that it effectively doubles your app store presence (and potentially your overall revenue) instantly. Moreover, word of mouth marketing for your app will also flourish due to the fact that people can (and will) download your freemium app for well... free. It's important to understand though, that the majority of your actual sales will come from people buying the paid version of your app, while the freemium version will serve more as a way of drawing in potential customers. For example, the iManga Reader Lite usually sees between 125 to 200 downloads a day, and between 3 and 7 in-app purchase "upgrades" to the full version. Where as the iManga Reader Pro sees between 10 and 20 downloads a day. Another great way to pad out your monthly app revenue, is through ancillary in-app purchases. These would be things that users could purchase to enhance their app experience, such as power ups, new characters, additional content, etc. The ideal supplemental in-app purchase item is something that is consumable, i.e. something that users can buy, use up, and then (hopefully) buy again.